New Zealand's Leading Collision Repair Experts. For over 40 years Wyatt Machine Tools has imported and distributed power tools, collision repair equipment and surface finishing products to trade professionals throughout New Zealand. 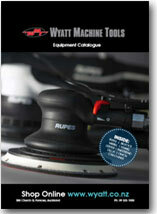 Wyatt Machine Tools is proudly a New Zealand owned and family operated business. As suppliers to the trade, we pride ourselves on providing quality products, technical expertise and exceptional customer service. RUPES, Farecla, Car-O-Liner, Pro Form, Smirdex, Deca, Elektron, OMCN, Porter Ferguson and many more...These brands represent our commitment to delivering high performance, high precision and high quality products to our customers at affordable prices. 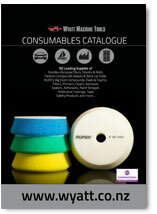 Click here for more information on the brands we sell. If you can’t find the product you need on our website please come and visit our Penrose showroom and see the extensive range of additional products we have available. Our experienced sales force can provide expert technical assistance or alternatively phone us 09 525 1000 and we can call on customers in and around Auckland. All equipment is backed up by our qualified after sales service department which is dedicated to the maintenance and repair of our range. We freight throughout New Zealand and depending on the brand will also export to the Pacific Islands. For sales enquires either e-mail or call us direct +64 9 525 1000. Our Showroom is open daily (Monday to Friday, 8.00am to 4.30pm) for both cash and account purchases and is located at 388 Church Street, Penrose, Auckland.